Classes for August, 2015 Along with special upcoming events. Open Monday – Friday: 8:30 A.M. to 1:00 PM. our classes and seeing all our regulars attendees. Walk in are also welcome. BINGO, STARTING SOON KEEP WATCHING FOR START-UP DATE! HICAP Presentation Friday September,18th at 11:30 Discussing: Understanding the Details of your Medicare Summary Notice! & How does “MY” socialsecuritay.gov. Help YOU? Walk-in’s are welcome or call 524-4533 tell us your coming. Classes for July, 2015 Along with special upcoming events. Open Monday – Thursday: 8:30 A.M. to 4:00 P.M. Fridays: 8:30 A.M. – 1:00 P.M. Thank you to all the Volunteers that helped out with our Fireworks Booth this year. BINGO CONTINUES AT THE FILLMORE SENIOR CENTER EVERY 2ND & 4TH “FRIDAY OF THE MONTH FROM 6:30PM TO 9:00PM Next one is July 10th & July 24th. Remember, More people the Bigger the Prize ! Dr. Hara: August 12th. & 26th. for his patients living in Fillmore with pre-arranged appointments. HICAP Presentation Friday August 21th. at 11:30 Discussing: Understanding the Details of your Medicare Summary Notice! & How does MYsocialsecuritay.gov. Help YOU? Walk-in’s are welcome or call 524-4533 tell us your coming. Classes for June, 2015 Along with special upcoming events. Dr. Hara: Wednesday. June 17th. & 24th. & July 7th. for his patients living in Fillmore with pre-arranged appointments. BINGO CONTINUES AT THE FILLMORE SENIOR CENTER EVERY 2ND & 4TH “FRIDAY OF THE MONTH FROM 6:30PM TO 9:00PM NEXT ONE IS June, 26th. Remember, More people the Bigger the Prize ! Spanish Class taught by Carmen Zermeno on Friday’s has ended and will start again in September. Help Wanted: Looking for part-time work? Apply at the Fillmore Senior Center for light hosting duties and program coordinating in the afternoon from 1pm to 4pm Call (805) 524-4533 for applications and directions. Low Vision Support Group will be meeting June, 25th. from 10 to 11:30 AM. at the Fillmore Senior Center Living with limited vision can be a challenge, but it need not be a barrier to living a fulfilling life. Our Low Vision Rehabilitation Specialist that also speaks Spanish, can show you other services that may help you perform tasks more easily such as Kitchen confidence, grocery shopping, organizing your household. Tools to manage finances, tips and resources for traveling, tapping into your creative side, personal care and grooming, how to get from here to there and back, staying connected to friends & family through computers and using special reading machines available thru the Braille Institute. Dr. Hara: Wednesday. June 3rd, 17th.. & 24th.. for his patients living in Fillmore with pre-arranged appointments. HICAP Presentation Friday June 19th. at 11:30 subjects that will be discussed are: What is the Benefits Enrollment Center? How it may provide “YOU” Extra Money! BINGO CONTINUES AT THE FILLMORE SENIOR CENTER EVERY 2ND & 4TH “FRIDAY OF THE MONTH FROM 6:30PM TO 9:00PM NEXT ONE IS June 12th & 26th. Remember, More people the Bigger the Prize ! Classes for May, 2015 Along with special upcoming events. Low Vision Support Group will be meeting May 28th 10 to 11:30 AM. at the Fillmore Senior Center Living with limited vision can be a challenge, but it need not be a barrier to living a fulfilling life. Low Vision Rehabilitation specialist can show you other services that may help you perform tasks more easily such as Kitchen confidence, grocery shopping, organizing your household. Tools to manage finances, Tips and resources for traveling, Tapping into your creative side, personal care and grooming, How to get from here to there and back, staying connected to friends & family through computers and using special reading machines available thru the Braille Institute. Dr. Hara: Wednesday. June 3rd.for his patients living in Fillmore with pre-arranged appointments. HICAP Presentation Friday June 19th. at 11:30 What is the Benefits Enrollment Center? How it may provide “YOU” Extra Money! Dr. Hara: Wednesday. May 20th..for his patients living in Fillmore with pre-arranged appointments. BINGO CONTINUES AT THE FILLMORE SENIOR CENTER EVERY 2ND & 4TH “FRIDAY OF THE MONTH FROM 6:30PM TO 9:00PM NEXT ONE IS May 22nd. Remember, More people the Bigger the Prize ! Next Board Meeting: is scheduled for Tuesday, May 18th at 3:00 pm The Center will be closed Monday 5/25 for Memorial Day. Tai Chi Monday’s at 8:50 AM – 9:50 Tai Chi is a Chinese martial art made up of a series of graceful movements, one transitioning smoothly into the next. The “Eight Active Ingredients” of Tai Chi, Some of which were; “Awareness” The slow deliberate movements and attention to breath, body positions and sensations foster intense self-awareness. “Strengthening and Flexibility” The integrated movements improve balance, increase lower body strength and promotes strong bones. Slow, continuous, relaxed and repetitive movement enhances flexibility, and in contrast to some other exercises, Tai Chi is very easy on your joints. BINGO CONTINUES AT THE FILLMORE SENIOR CENTER EVERY 2ND & 4TH “FRIDAY OF THE MONTH FROM 6:30PM TO 9:00PM NEXT ONE IS May 8th & 22nd. Remember, More people the Bigger the Prize ! Open 8:30 A.M. Monday-Friday & 1:00 P.M.
Wednesday’s 9-10:30 Busy Hands / 10:30 Line Dancing / 10:00 Book Club February,18TH). BINGO CONTINUES AT THE FILLMORE SENIOR CENTER EVERY 2ND & 4TH “FRIDAY OF THE MONTH FROM 6:30PM TO 9:30PM NEXT ONE IS March 27th. Dr. Hara: Wednesday. April 1st.& 15th..for his patients living in Fillmore with pre-arranged appointments. Spanish & English “As a second language” Classes are taught by Carmen Zermeno on Friday’s. Spanish from 9:00 to10AM, The English class will start April 10 at 10:30-11:30 the requirements for the “English as second language” is at lease, 5 students attending regularly to have this class. Both classes focus on reading, writing & conversation. Both classes are a great way of learning to speak Spanish or English and have fun learning at the same time. Students should bring a binder or clip board to keep class lessons in. Anyone interested in the English as second language please call 524-4533 before April 7th. Los viernes habrá Clases de Inglés y Español Principiante en el Centro de la Tercera Edad. La Clase de Español es a las 9:00 a.m. y dio principio en enero. La Clase de Inglés comenzará el 10 de abril del 2015 a las 10:30 a.m. Para que la clase de inglés de comienzo, necesitamos por lo menos 5 estudiantes que vengan regularmente. Las dos clases se enfocan en lectura, escritura, y conversación. Los estudiantes deben traer una carpeta donde puedan guardar su trabajo de la semana, un lápiz o pluma y ¡muchas ganas de aprender! EL costo es $3.00 por clase (contribución al centro) Si se interesan, llamen al 524-4533 antes del 7 de abril. Carmen Zermeño, instructora. AARP DRIVERS SAFETY CLASS “RESCHEDULED AGAIN TO APRIL 13 & 14 the class is 8-hours, split into two 4 hour parts, from 9:00 am-1pm The AARP’s Driver Safety Classroom course teaches how to avoid driving hazards and become a better, more aware driver. You must be 55 to take the class and to receive a reduction in insurance premiums. You must attend both days. AARP members have a discounted class fee. You will receive a Certificate for attending and it is good for three years. Call the Fillmore Senior Center to register in advance 524-4533. Classes for March & April, 2015 Along with special upcoming events. Low Vision Support Class is March 26, at 10:00 Are you a “VIP” Visually Impaired Person? All VIPs, regardless of level of vision loss, are welcome to join this fun loving and supportive group every Fourth Thursday from 10:00 a.m. until noon at the Fillmore Senior Center. Come and learn useful techniques to deal with your vision, such as magnification, visual aids, living skills classes, talking books, library services, and more. Steve from the Braille will be here from 10:00-1:00 also. For more information you can call Brenda Birdwell at 805-886-6025. AARP DRIVERS SAFTY CLASS HAS BEEN “RESCHEDULED AGAIN TO APRIL 13 & 14 the class is 8-hours, split into two 4 hour parts, from 9:00 am-1pm The AARP’s Driver Safety Classroom course teaches how to avoid driving hazards and become a better, more aware driver. You must be 55 to take the class and to receive a reduction in insurance premiums. You must attend both days. AARP members have a discounted class fee. You will receive a Certificate for attending and it is good for three years. Call the Fillmore Senior Center to register in advance 524-4533. Classes for March, 2015 Along with special upcoming events. AARP Driving Safety Class has been “Re-scheduled” to March 22 & 23 This class is 8-hours, split into two 4 hour parts, from 9:00 am-1pm. This is the perfect place to sharpen your knowledge of traffic laws and your driving skills. The AARP’s Driver Safety Classroom course teaches how to avoid driving hazards and become a better, more aware driver. You must be 55 to take their class and to receive a reduction in insurance premiums. You must attend both days. Class fee is $15 for AARP members and $20 for non-members, and you will receive a Certificate for attending it is good for three years. Call the Fillmore Senior Center to Register in advance 524-4533. Dr. Hara: Wednesday. April 1st..for his patients living in Fillmore with pre-arranged appointments. Book Club March 18th.. at 10:00 am They will continue to discuss “ A Higher Call” and “The Girls of Atomic City”. BINGO: is the 2ND and 4TH “FRIDAYS OF THE MONTH” 6:30PM TO 9:30PM next one is March 13th & 27th, 2015. Dr. Hara: Wednesday. March 4th, & 18th.for his patients living in Fillmore with pre-arranged appointments. Applications are available now for membership in the Seniors Craft Shoppe, a nonprofit co-op providing a sales outlet as well as social and volunteer opportunities for Ventura County senior crafters. 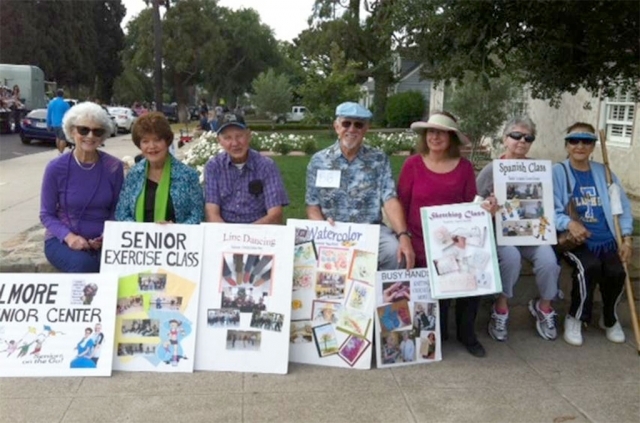 Members must be residents of Ventura County, 50 years of age or older, and able to volunteer about 20 hours a month. For further information or to apply, please visit the shop at 429 E. Main St., Ventura. Shop hours are 10 AM to 5 PM Monday through Saturday, and 11 AM to 4 PM Sunday. Fillmore Senior Center will be Closed February 16th Presidents Day, but Open again on Tuesday, see you then. Dr. Hara: Wed. February 18th.for his patients living in Fillmore with pre-arranged appointments. Gourd Class Wednesday, February 18th at 12:30 – 3:00 This month only the class will be held on Wednesday..
Mixed Media Art Class has been canceled for one Month due to illness of the Teacher. Low Vision Support Class is February 26, at 10:00 Are you a “VIP” Visually Impaired Person? All VIPs, regardless of level of vision loss, are welcome to join this fun loving and supportive group every Fourth Thursday from 10:00 a.m. until noon at the Fillmore Senior Center. Come and learn useful techniques to deal with your vision, such as magnification, visual aids, living skills classes, talking books, library services, and more. Steve from the Braille will be here from 10:00-1:00 also. For more information you can call Brenda Birdwell at 805-886-6025. Spanish Class Every Friday’s at 9:00 am the class is taught by Carmen Zermeno, this Class is a great way to learning to speak Spanish and have fun learning at the same time. Carmen includes games and recipes. Students should bring a binder or clip board to keep class lessons in. Tuesday’s	9:00 Yoga Class (Not on Feb. 3rd, 5th. or 10th.) / 10:00 Mixed Media Art Class / 12:30-3 Gourd Class. Dr. Hara: Wed. February 4th & 18th.for his patients living in Fillmore with pre-arranged appointments. Hi CAP Presentation scheduled for February 20th at 11:30 am. more information next week. Spanish Class the class is taught by Carmen Zermeno and is scheduled for every Friday at 9:00. This Class is a great way to learning to speak Spanish and have fun learning at the same time. Carmen includes games and recipes. Students should bring a binder or clip board to keep class lessons in. Tuesday’s	9:00 Yoga Class / 10:00 Mixed Media Art Class / 12:30-3 Gourd Class. SENIOR CENTER OPEN HOUSE Saturday January 31, 10:00 – 2:00pm If your are 55-and-up and are looking for a place to play cards and board games, have a dinner or two, watch a movie, take a bike ride or hike our local terrain, we are looking for you. If you have a hobby or talent you are willing to share, we would love to have you join our team of volunteers. Our Teachers will be here to demonstrate the different classes already here at the center. Dr. Hara: Wed. February 4th & 18th.. for his patients living in Fillmore with pre-arranged appointments. 10:00 am – 1:00 pm if you need any special vision tools to help you see better. New 2015 Beginning Spanish Class the class is taught by Carmen Zermeno and is scheduled for every Friday at 9:00. This Class is a great, your learning to speak spanish and have fun learning at the same time. Carmen includes games and recipes. Students should bring a binder or clip board to keep class lessons in.